Do you live in the North West Province and have an original idea that can benefit your community? All you need to do is SMS your idea in less than 50 words to 30041 and you could win your share of prize money and benefits to the value of R100 000. 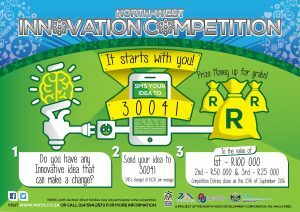 The North West Innovation Competition is a project the by the NWDC, TIA, FEED and the NWU. Click through to the Competition page for all the details.